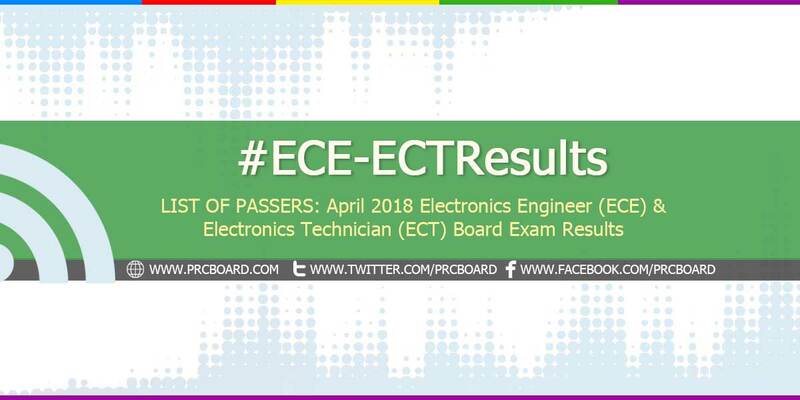 The results and list of passers of the April 2018 Electronics Engineer (ECE) and Electronics Technician (ECT) board exams including the top 10 examinees, top performing schools and related announcements are available at this website as the Professional Regulation Commission (PRC) officially releases the results online three (3) working days after the last day of board examinations. As announced, 1,208 out of 2,663 passed the Electronics Engineer Licensure Examination and 1,141 out of 1,483 passed the Electronics Technician Licensure Examination. The licensure examinations are administered by PRC Board of Electronics Engineering headed by its Chairman, Engr. Alnar L. Detalla and its members, Engr. Enrico Claro R. Delmoro and Engr. Herminio J. Orbe on April 4-5, 2018 (ECE) and April 6, 2018 (ECT) at PRC testing centers in Manila, Baguio, Cagayan De Oro, Cebu and Davao. The schedule of online appointment for issuance of Professional ID and Certificate of Registration will be from April 19-25, 2018. As per Resolution No. 2017-1068 entitled "Schedule of Licensure Examination for Year 2018", the target release of April 2018 ECE and ECT board exam result will be on April 12, 2018 (Thursday) or four (4) working days after the last day of exams. On the same exams conducted by PRC on October 2017, results were released after four (4) working days while on August 2017, February 2017, August 2016 and March 2016, results were out after three (3) working days. ECT: Technical Subjects and Laws and Ethics (Basic Mathematics, Ohm's Law, Electronic/Electrical Machine or Equipment, Test Equipment, Electronic/ Electrical Component, Maintenance and Repair, Philippine Electrical Code, Philippine Electronic Code and RA No. 9282. Electronics Engineering is one of the programs with average number of examinees being administered by the Professional Regulation Commission. On the most recent exams conducted October 2017, 2,235 out of 4,784 examinees hurdled the ECE while 2,916 out of 3,258 ECT examinees passed. Dino Dominic Forte Ligutan from De La Salle University - Manila ranked first in the ECE exams garnering 94.40% rating followed by Williard Joshua Decena Jose from University of the Philippines - Diliman having 93.40%. UP Diliman got the first spot in the ECE top performing schools' list having 59 out of 60 examinees passed or 98.33% passing rate. UST and Technological University of the Philipines - Visayas were the top performing schools in ECT board exams having 100.00% passing rate. Meanwhile, below is the summary of board exam results for ECE and ECT in the last four (4) years. To receive up-to-date news about ECE and ECT results for April 2018, we advise our visitors to bookmark this page, visit PRC official website or follow us at our social media pages via Facebook and Twitter. Sana makapasa po c vincent Rosal Ferrer sa ECE Board exam sana makasama po pangalan nya sa successful Board Exam Engineer Glory to God. Good luck everyone! Today is the day... Keep the faith! AEUS ESPALDON FOR THE WIN. God bless. Keep the faith. God Bless sa ating lahat! Sana po mag top si Siobhan Weaver! !